My third wedding anniversary is just around the corner, and when we got married, my husband and I decided to stick to the "traditional" anniversary gifts (which is weird, since nothing else about our wedding was traditional). The first year is paper, the second is cotton, and the third is leather. We were pretty good about surprising each other for the first two, but decided for this one that we'd like each other's help picking out gifts. He'd like some new dress shoes, and I'd like a black leather bag - I actually don't own one. I have a lot of requirements of such a bag. I'd like it to have shoulder straps but also a cross body strap. It has to have easy access outer pockets. I'd like it to have a little character, maybe some interesting hardware, but nothing that will go out of style any time soon. Big enough for a notebook. That's not too much to ask, right? 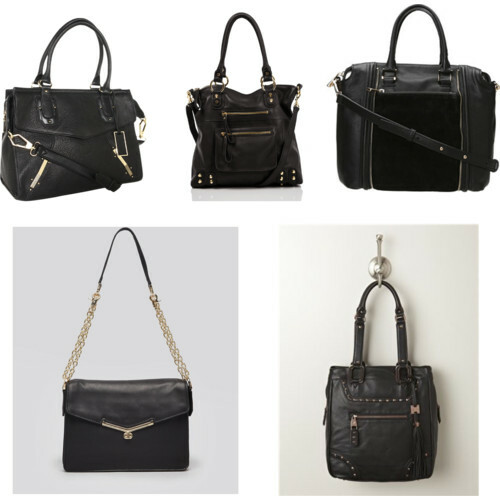 Here are a few options I'm considering (clockwise from top left, click image to link to sites): Vince Camuto Annette $298, Linea Pelle Dylan $475, Kelsi Dagger Sunham Satchel $173, and Botkier Shoulder Bag Valentina $295. Thoughts?